Put your home's rainwater runoff into service by collecting it for garden and lawn use. Rainwater collection has an ancient history with archeological evidence dating back at least 4,000 years. Urban demand created the centralized water systems we use today, but that doesn’t mean harvesting water doesn’t have benefits to home gardeners. Collection is easy and a necessity in drought-prone regions. In fact, many cities throughout the country offer incentives like tax rebates to encourage citizens to install rain barrels. And if nothing else, the pleasure of a lower water bill might be a motivation to take a few minutes for the installation of a rain barrel. 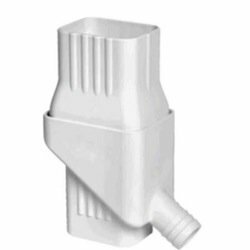 • A gutter and downspout to channel rainfall runoff from the roof—you could use either a PVC-type rainfall diverter that prevents overflow or a plastic flex hose. • A storage tank or cistern—this could be as simple as a trashcan, fiberglass cistern, or steel drum. Get one that is opaque in order to discourage algae growth. • Something to stop debris from ending up in the tank—this can simply be a screen at the top of the gutter or a strainer basket at the mouth of the cistern. Find the gutter where you will be collecting and unscrew the downspout. Cut a notch into it with tin snips, so that the diverter fits snugly within. Reattach the diverter and downspout to the house wall, then lead the diverter’s plastic hose to the rain barrel. 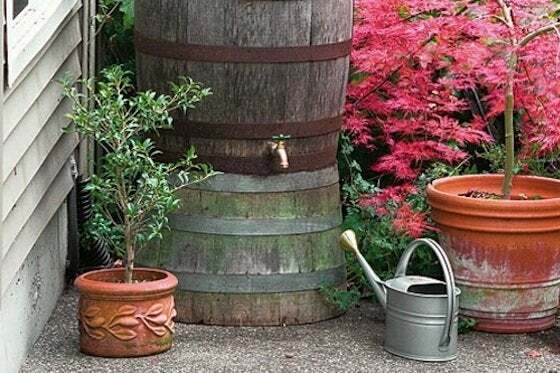 Place the rain barrel on level concrete cinderblocks to raise the barrel above ground level (and to let gravity assist in watering your landscape). Install screens to prevent leaves and twigs from accumulating and contaminating the water. After drilling a hole and screwing in the spigot and attaching the soaker hose, you’re all set. Please keep in mind that this water is for the garden, not for drinking!